First off, I am going to make this as short as possible, I want to briefly touch upon the 'wobble' feature the PS4 is currently displaying to its consumers. The wobble is simply part of the design features; the PS4 is purposely like that. The console isn't faulty of not being flat or completely horizontal, because it is. The PS4 is 100% parallel to the table (Figure 1). 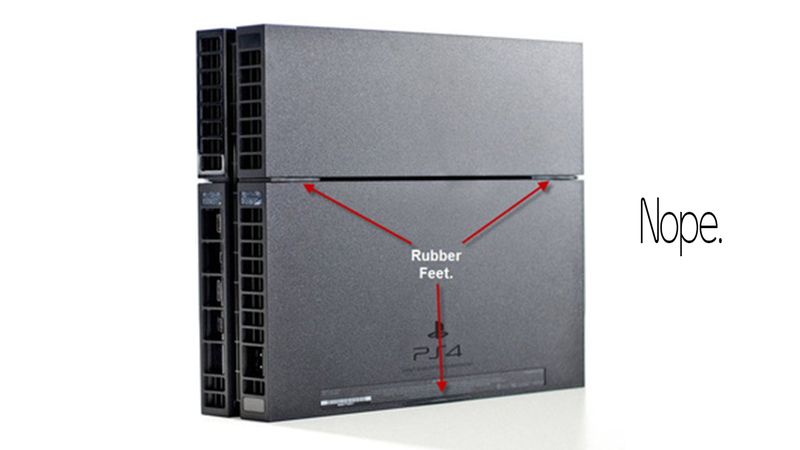 The reason it tips like that is because the left side of the PS4 is an overhang, like a terrace or balcony (See the header image to the article). The PS4 is designed like that. When the console is pushed down on, the two inner feet create a lever, one of the worlds six simple machines. The thing does not 'wobble', the system will only 'tip' if you press down on the one side with an unessessary amount of presure. Wobble would imply a faulty bottom with warped plastic causing an uneven balance. A tilt implies to push down and one end to raise the other; exactly what the PS4 does. It is completely stable, and wouldn't wobble in an earthquake. It is a bit peculiar, but people are missing the research on the PS4 architecture and are jumping to false conclusions. Steve Marinconz covered this issue earlier today over at Kotaku main, but he left people more confused than answered. In his featured video he explains the positioning of the feet, but did not go into further detail and just claimed, "So it is not completely off balance." Leaving readers thinking there is a design flaw, but that it is a minuscule one because there is a decent balance to the console. For me I will be positioning my console vertically, for the shear sake that my desk only has room for it in that position if I want to fit it between my horizontally lying PS2 and PS3. Greatness Awaits!